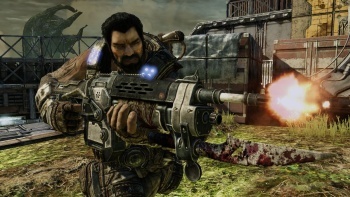 The special Gears of War 3 unlocks promised to gamers who play Bulletstorm and other Epic games won't be unlocked after all. Back in December, Epic Games Design Director Cliffy Bleszinski said on Twitter that certain achievements earned in Epic titles like Bulletstorm, Shadow Complex, Unreal Tournament 3 and the previous Gears games would trigger "special unlocks" in Gears of War 3. Specifics were never announced but hey, free bonus stuff is free bonus stuff. Alas, it turns out that Cliffy spoke too soon. Joe Graf, the lead gameplay programmer on Gears 3, Tweeted last night that it can't be done for non-Gears games. "Turns out that we can't read the Bulletstorm, Shadow Complex, and UT3 achievements for unlocks in Gears3 afterall," he wrote. "Sorry about that all." According to OXM, the inability to read the unlocks is due to restrictions in the Live service itself, which requires "devious and unsupported manipulation of the Xbox Live servers" in order to access anything beyond a person's Gamercard and avatar. Fortunately, because the previous Gears releases are part of the same "publisher/dev family," achievements earned in those games will trigger the unlocks; Graf also said that Epic will transfer the unlocks planned for non-Gears games to "other cheevos" in the Gears series. Gears of War 3 is currently slated to come out in the fall of this year, exclusively for the Xbox 360.